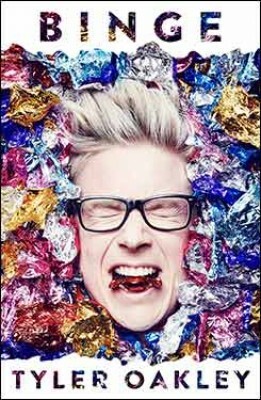 Despite being 23-years-old, I'm not ashamed to admit I love Tyler Oakley. In fact, I'm a big fan of a lot of Youtuber's and whilst I'm not the typical screaming fangirl, I do look forward to hearing more about my faves so when Tyler announced he was writing a tell-all memoir, I couldn't wait to pre-order it. Tyler has always been one of those people whose personality just radiates - whether that be through a screen or off a page, so reading Binge was just like having a nice conversation with a friend over a glass of wine. Binge features stories that we've never heard before, photographs from his childhood and exclusives that we never expected (PS. His name's not really Tyler!) I loved reading each and every page and learning more about a man I've grown to really admire - and it was all told in a voice that was very "Tyler" using his catchphrases and terminology, I could hear his voice reading the lines as I read them. The one aspect I had a slight issue with was that the stories switched from one to another very quickly and it all felt very rushed. I'm not a fan of comparing books, but I can't help but draw a comparison to Shane Dawson's I Hate My Selfie. In Shane's book, he had a chapter for each story - so you knew where each started and ended. I liked that. It was clear, concise and I didn't need to pause and think "oh, this is a different story now" as I felt myself doing whilst reading Binge. Tyler would finish one story and move onto another within the next paragraph, with very little separating the two. I found this to be a little disjointed whilst reading but understand that he had a lot he wanted to share, and only one book to share it in. I really enjoyed reading Binge and I feel as though people who don't know Tyler would enjoy it too. His comedic way of speaking is portrayed really well through text and his witty humour is one of the main things I love about him. Reading this book made me happy and whether you're a fan of Tyler or not, I'd strongly urge you to pick up Binge.